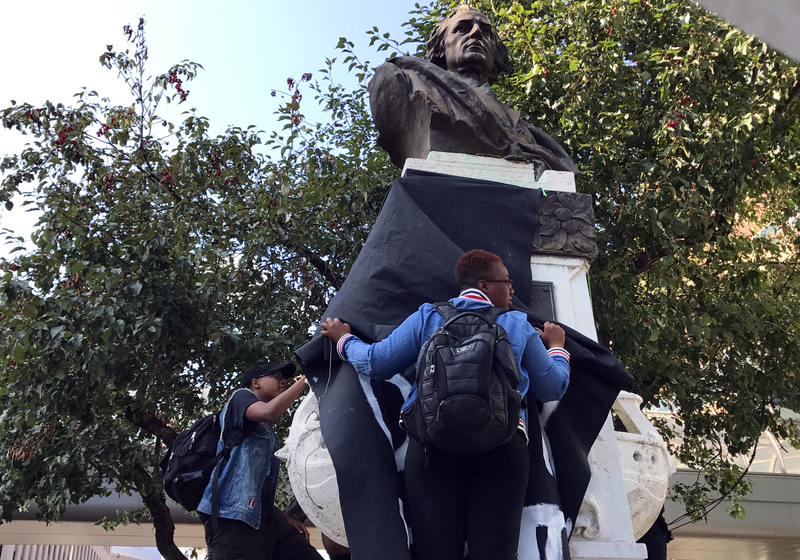 Protesters drape a black cloth over the Christopher Columbus statue in downtown Detroit. Photo by Steve Neavling. An online petition calls for the removal of the Christopher Columbus statue from downtown Detroit. More than 1,000 people signed the petition since it was posted earlier this week on Change.org. The petition, which addresses Detroit City Council and Mayor Duggan, also calls for the end of Columbus Day in the city. A coalition of cultural, religious and social justice organizations joined Raiz Up, a neighborhood collective in southwest Detroit, to organize the petition drive. “We demand that the city memorialize one of our cultural/political forbears such as Tecumseh, Sojourner Truth, Charity Hicks, Chief Pontiac, Judge Damon Keith, or Grace Lee Boggs,” the petition reads. “We further demand that the city commission a Detroit artist to create the new monument working with a committee of local historians, scholars, and organizers to to ensure that this new memorial, and existing monuments throughout the city represent the values and stories that we honor. The groups say Columbus represents violence and genocide, and his statue symbolizes mass slaughter. Columbus advocated fighting and enslaving native groups because he perceived them as cannibals. Those who weren’t killed often were forced to mine gold under brutal conditions. Columbus and his crew also sold nearly 1,500 enslaved islanders to Europe. The statue was dedicated to the city of Detroit on Oct. 12, 1910, and originally sat at the north end of Washington Boulevard at Grand Circus Park. The bust was moved to Jefferson Avenue and Randolph in the late 1980s. Duggan, who has called on renaming Cobo Hall because it’s named after racist former Mayor Albert Cobo, declined to comment on the petition.